"We have to reach out to people through our workers ... and win the forthcoming Parliament polls. 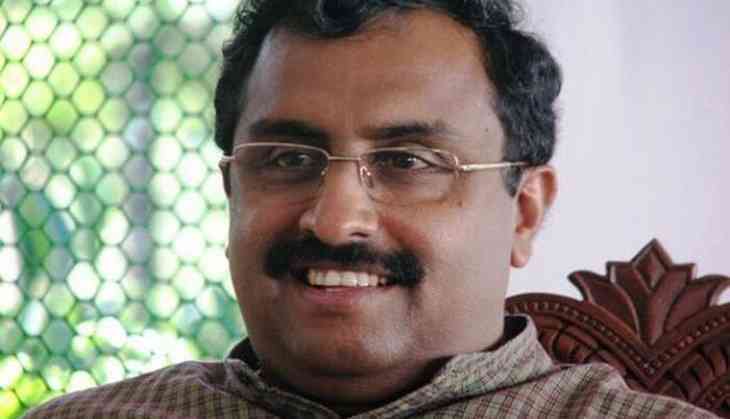 There is possibility of holding polls to J&K legislative assembly at that time (LS polls)," Madhav said while addressing a function here. Madhav and the party's national vice-president and J&K in-charge Avinash Rai Khanna kick started the BJP's 'Mera Parivar, Bhajpa Parivar' campaign in the state by hoisting party flags at different places across the state. Madhav said "We have to ensure victory of the BJP, so that it forms the government in Jammu and Kahsmir again...We have got 25 seats in previous (assembly) elections and in coming polls we should win more, particularly in Jammu region, where we have blessing of the people". He said the people of Jammu gave BJP two parliament seats. "We have expressed thankfulness to the people and will go back to them to seek their blessings in forthcoming elections for voting in favour of BJP." "We have got the blessings in 2014 and 2015 elections, and we expect that people will bless us in the same way in 2019 polls. BJP can only protect the rights of Jammu region. We have to give this assurance to the people of this region", he said. He said Kashmir centric parties PDP and NC are trying to fightelections jointly with the Congress, which calls itself as a national party. "Congress too has indicated that they are ready for the coalition in Jammu, and they know that nobody in Jammu have takers for them if they do not go for the coalition", he said, claiming Congress has accepted its defeat before the elections. The BJP leader said the massive response to the Prime Minister's February 3 rally has indicted that people of Jammu region are with Narendra Modi. "We had won Parliament seat of Ladakh in last elections. We have also formed hill council. We could not fulfill the demand of Ladakh when we were in coalition government in J&K , but under governor's rule we have fulfilled their demand by granting them separate Ladakh division with a separate university. Now there is all out efforts to ensure the speedy development of the Ladakh region", he said. "We will appeal to the people of the state to tell us what why type of government they want in J&k", he said, adding the party will incorporate their suggestion in its manifesto. Under the programme the party flag carrying its poll symbol lotus will be hoisted and the stickers will be pasted on houses of all the party leaders, workers as well as the party supporters. It is the symbolic expression that the BJP is not just a political party, but a closely knit family that is bounded by the feelings of emotions while sacrificing own pleasures for the sake of one greater family, our motherland, Khanna said.